(Construction Global) Buildoffsite is a membership organisation, referred to as ‘a coalition of the willing’ and has been formed to support a step-change increase in the use of offsite construction solutions. Set up with the support of the UK government almost a decade ago and now comprising more than 100 organisations from the construction industry and client industry, the organisation challenges the supply side of the sector to continuously improve how they influence the traditional construction practices. In turn, Buildoffsite has brought together a vast number of repeat construction clients from all sides of the industry who understand that through encouraging and, in some cases, demanding the use of offsite solutions, they will achieve the desired value. Here, Construction Global spoke to Buildoffsite’s Chairman, Richard Ogden about the knowledge transfer organisation and its influence on the growing trend of offsite construction. Construction Global (CG): When did you first recognise offsite becoming a growing technique and what is the history of this approach? Richard Ogden (RO): The history of offsite construction is as old as construction. Understanding that it makes sense to construct components and then to transport these to the place of final assembly and use was something that was well understood by the civilisations of Ancient Egypt and Rome. Personally I began my offsite journey when I became responsible for McDonalds Restaurants build programme. At that time inflation was rife and the cost of construction using traditional methods was not commercially viable. The solution that we developed was to build our restaurants using modular solutions, constructed and fitted out in a factory and delivered just in time for assembly on site in a couple of days ready to trade. This approach totally changed the economics of our business and was subsequently taken up by the major food retailers and others. Other businesses will develop their own solutions to meet their particular business requirements. However, in almost all cases the critical considerations when considering the use of offsite solutions will include much faster build times, right first time quality, a safer construction environment, predictable performance in use, enhanced sustainability and given the opportunity to deliver products at scale, cost benefits. CG: To what extent do you see offsite construction as a growing sector? RO: There is no doubt that offsite construction solutions are being increasingly used in all sectors of the building and civil engineering sectors. In some sectors maximising the use of offsite solutions is already standard practice. The Cheesegrater building in London was constructed using almost 80 percent offsite components. There were no wet trades above ground floor. This is the way the leading edge is already going – and the question is not why but why not? In terms of future growth I predict that for a whole raft of different reasons we will begin to see a major expansion in the use of offsite in the housing and residential sectors. 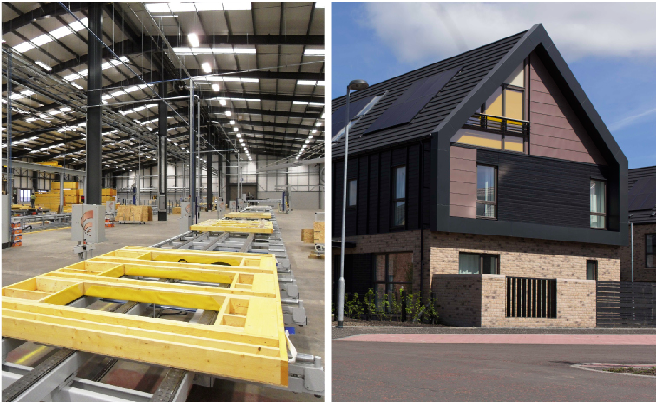 Offsite is actually reasonably well established in residential but for a long time, and for reasons mostly associated with the stop go/sell then build mentality of homes building it has been difficult for offsite suppliers to compete effectively. However the dynamics of the market are changing with major institutional funders looking to invest and bringing with them a mindset that will focus on speed of delivery, quality and predictable cost of ownership. Refurbishment and maintenance are also challenging areas for offsite solutions, but by no means impossible. This is particularly the case for clients who need work completed quickly so as not to impede their core business activities. I also predict that the growth in enabling technologies such as BIM and 3D imaging will connect seamlessly with the strengths of offsite manufacturing. CG: Why is the offsite method gaining in popularity so much? What do you use as the main advantages of an offsite approach as compared with traditional builds? RO: I have no problem with traditional construction. I greatly admire the skills that those who work in the industry have honed over the years. That said I do not believe that simply because construction has generally been carried out on site using a set of basic materials or components is in some way morally or technically superior. What we have seen happen in other manufacturing sectors over the last 30 years or so has clearly shown this not to be the case. Our best manufacturing industries – those that are truly globally competitive – have long since learned that modern manufacturing involves assembling increasingly complex and superbly engineered components. This transformation has had no negative impact on design excellence, on quality, on performance in use – quite the opposite. Customers have benefited, prices have been reduced, quality has been enhanced, mass customisation is the norm and not the exception. So if this way of working is the norm for other manufacturing industries why should things be different for the construction industry? At the end of the day the market will decide and the more that the leading edge demonstrate that the future of construction is offsite the faster that offsite will simply become the norm – notwithstanding the inevitable pleading from some special interest groups. CG: What do you think is the future of offsite construction? Can it ever challenge traditional methods for supremacy and what are your personal goals as an organisation? RO: Buildoffsite’s modus operandi is not to challenge the traditional industry but rather to support knowledge transfer activities that serve to educate, inform and yes, to inspire the offsite industry to become more and more competitive and clients to become ever more demanding. Given client pull and manufacturer push and with positive and self-interested support from architects, designers and other professionals there is an inevitability that offsite will continue to grow to the point where it becomes business as usual. I would dearly wish the traditional industry to respond – to show that it can be so much more productive, to deliver defect free construction, not to waste approximately 10 percent of all materials and never to have accidents. However, that is just not going to happen. So quietly and with growing confidence, Buildoffsite will get on with our job and we will leave the traditional industry to get on with theirs. This entry was posted in Business, Technology and tagged build off site, buildoffsite, pre-fab. Bookmark the permalink.